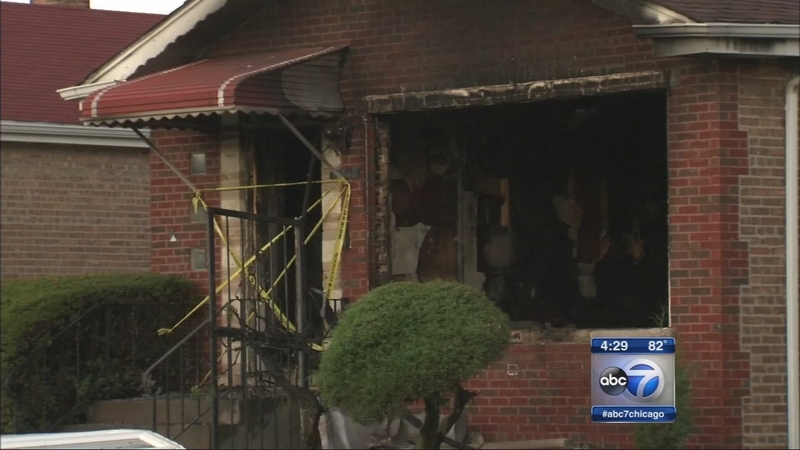 CHICAGO (WLS) -- A man found dead after an explosion and fire at a home on the city's South Side died of a gunshot wound to the head, the Cook County Medical Examiner's office said Tuesday. Police are now searching for his car. Investigators say a 2004 black Buick LeSabre is missing from the home. The license plate number is V617710. Firefighters responded to a home in the 10800-block of South Morgan Street around 12:40 a.m. Monday and found the house fully engulfed by flames. The force blew out the windows and left a huge hole in the one-story home. The death is being investigated as a homicide and the fire appears "suspicious," officials said. Fire detectives said natural gas was not a factor and the case is being investigated as possible arson. The body was badly burned and has not been positively identified. There was an explosion and fire at a home in the 10800-block of South Morgan Street in the Morgan Park neighborhood on the city's South Side.